Plus: Can I live here for US$730 per month? All properties in this article are priced in U.S. dollars. I’m writing today to tell you about a limited-inventory opportunity that just came onto the market. If you’re interested, you can save up to 25% (as much as US$30,000) as an Overseas Property Alert reader—if you’re among the first 15 cash buyers. This offer will be sent to readers of Overseas Opportunity Letter next week, but I wanted to extend it to you first, before it went to the general population. The opportunity is a prelaunch offer for the Los Árboles Cobá project. The project is located on Mexico’s Riviera Maya on the Yucatan Peninsula, south of Cancun. Los Árboles Cobá is a sustainable, off-the-grid community, which nonetheless offers amenities like high-speed Internet, phones, and satellite TV. The lots are large tracts of old-growth jungle with very low development density—less than 15% of the property. Note that when I use the term “sustainable, off-the-grid” I’m referring to a property that can function without any connection to public utilities, located in an area with an all-year growing season. Los Árboles Cobá will appeal to those who enjoy a lifestyle among nature and wildlife, in a home that will function comfortably with no connection to the outside world. It will also appeal to investors looking for an early-in, special offer with resale in mind. The market in this area is performing well, and has been for several years. 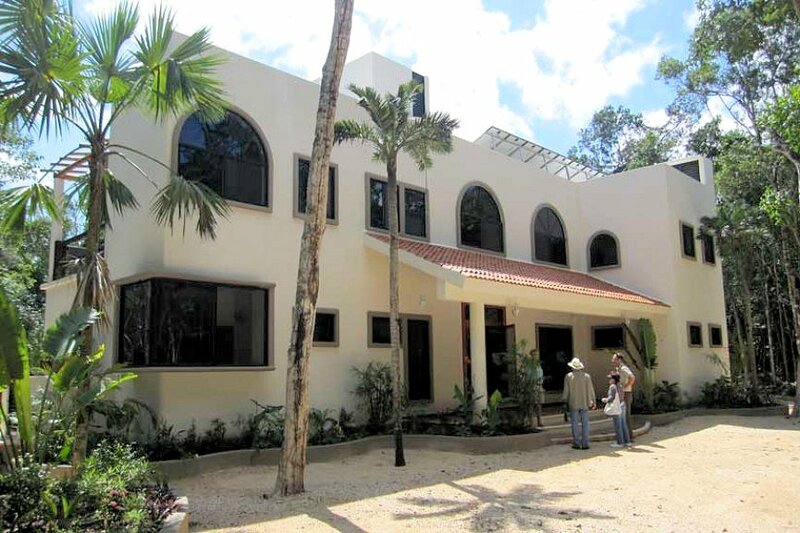 The nearby sister project of Los Árboles Tulum was a popular seller, has a number of homes constructed with North Americans in residence, and made money for early buyers. The developer has a solid track record of success for this type of project. The entry point for buyers and investors is low—less than US$37,000. The Riviera Maya is the section of Caribbean coast on the eastern side of the Yucatan Peninsula between Playa del Carmen and Tulum. Today however, that envelope is being stretched by towns who want to be included in the Riviera Maya brand: southward to Punta Allen, and northward to Puerto Morelos, almost to Cancun. It’s about 125 miles overall. The beaches in this area are some of the world’s most beautiful. But equally important to the investor is the Path of Progress angle. Cancun—one of Mexico’s top two resorts—began in 1974 as a tourism project on a small fishing island. As it exploded into a city of more than 700,000, the swath of development extended southward towards Playa del Carmen, transforming it from a fishing village to a town of more than 150,000 today. Today, Tulum is squarely in this Path of Progress. Just a few years ago, the town consisted of a handful cabins and a few fishing shacks. Today, the census counts more than 18,000 people there. It contains about 125 miles of beautiful Caribbean beaches. The climate is warm and tropical all year. Cancun’s international airport—less than 1.5 hours away—provides easy access to the United States and Canada. 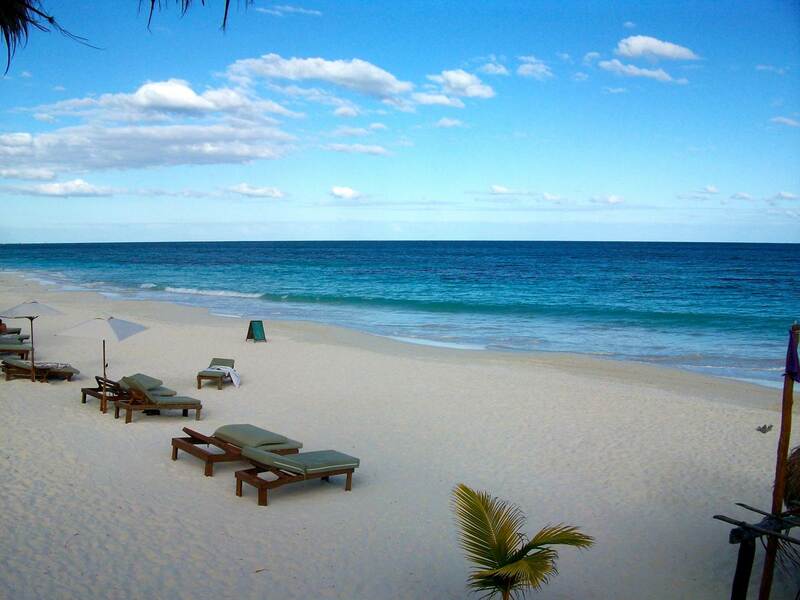 The Riviera Maya provides more than 60% of Mexico’s tourist income. 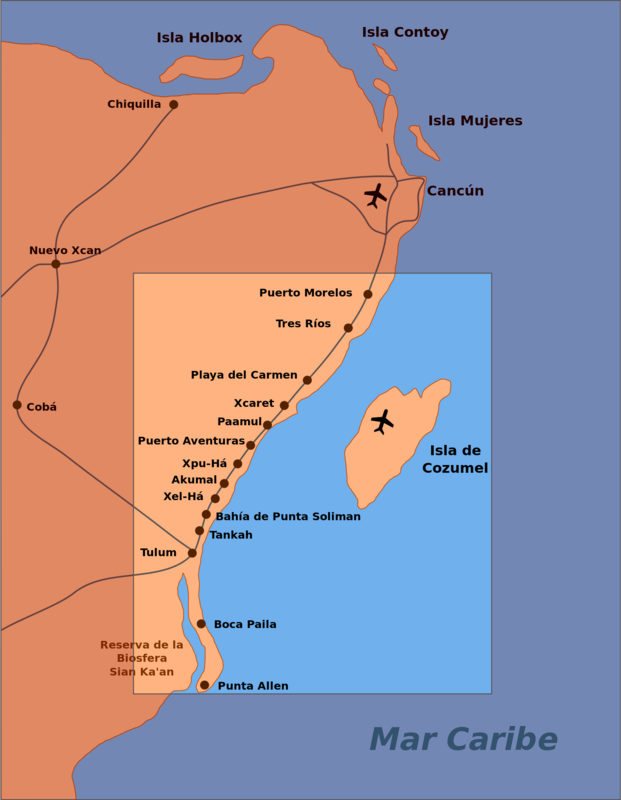 High prices and existing development are found at the northern end of the Riviera Maya; low prices, low development, and high opportunity lie to the south. The area features warm Caribbean waters and pristine beaches. Also, the Great Mayan Reef—the second largest in the world—is located nearby, providing world-class diving and snorkeling. Another draw to this area is the presence of the best preserved Mayan archeological sites…plus a few world-class golf courses to round out the local attractions. The Los Árboles Cobá project is located about 20 minutes inland from Tulum. It’s a fully gated community consisting of 1,200 acres of old-growth jungle. The project is rich with local plant and indigenous wildlife. Of the total property, only 15% is available for development, and the lots are large. Buyers can clear only a modest amount of land around their homesite, which in turn must be set back a good distance from the property line. Los Árboles Cobá is close to Mayan archeological sites, the Sian Ka’an Biosphere Reserve, and the second largest barrier reef in the world. Also, high-speed Internet, telephone networks, and satellite TV are available. Modern medical facilities are nearby. Los Árboles residents are not living in grass shacks. Here’s an example of a resident who took full advantage of the area’s low construction costs. If you’re interested in a self-sustaining, off-the-grid property, than you should look closely at this offer…it’s the best one I’ve seen in a while. Also, this deal will be of interest to prelaunch, early-in investors. Feel free to contact the developer directly for more information, or to make a reservation. Follow the link to connect with Patricia Saucedo of Los Árboles Cobá. I live on about US$730 Social Security. What’s the chance of someone making it in Belize on that amount? I’d be buying land, and living there. Indeed, most Belizeans make less than US$730 per month, so it can be done. At that income level, you’d be making more than the median for an elementary school teacher, and a bit less than a high school teacher. But it won’t be the comfortable lifestyle that you may be hoping for. Life will be basic. And remember, Medicare, Medicaid, and all of the other American “safety nets” are not available outside the United States…so be sure to take those somewhat-intangible “incomes” into account when doing the numbers. To get info on low-cost homes, check out Rainforest Realty in Belize. These next three questions were in response to last week’s article on setting up a Solo 401k, in order to buy overseas property. Is there any restriction on upper age limit when setting up a self-directed 401K? Am I correct that a person could be retired and have only minimal part-time employment? Correct: There is no upper age limit when setting up a Solo 401k. If you are over 70 ½ however, Required Minimum Distributions (RMDs) will apply, as they would for an IRA (except Roth IRAs). Follow the link to see the IRS rules for RMDs. I am very interested in the Solo 401K and using Woody Funderburk of Capkey. With that said, is Woody of Capkey a Facilitator? Per what you wrote, you do not need a custodian for a Self-Directed or Solo 401k but you also stress that there is a lot of work involved and that some people “employ a facilitator or advisor to keep their records straight”. Is Woody all that I need to avoid penalties for misuse or do I need a facilitator besides Woody? Yes, in the terminology of my article, Woody Funderburk would be a facilitator. And as part of his US$250 annual fee, he will keep your 401k plan up-to-date with any IRS changes, and issue any necessary plan revisions to you. He will have information on the rules you need to follow and records you need to keep. If you’d like his help with declarations and record-keeping, you should contact Woody directly and tell him what you want. Do you have a security license or registration with FINRA? Or a real estate license? A fair question…and the fact is that I don’t sell securities, and I don’t list or sell real estate. I don’t get finders’ fees or receive commissions. As a freelance writer, my job is to seek out opportunities and write about them here. If a reader decides to buy something, they deal directly with a developer or broker, who will be licensed and qualified in accordance with the laws of the country they operate in.